I just love these when I saw them you could say love at first sight . Unfortunately when I opened the box the nightstand had a few things wrong I had to return. I still give it a 5 star sometimes thing happens. 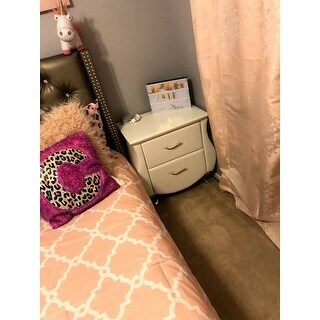 With two storage drawers Erin Modern and Contemporary Faux Leather Upholstered Nightstand is perfect for keeping those everyday small items. Compact enough for sitting next to your bed or around the home for quick easy access. Meticulously crafted, the Erin is constructed of solid hardwood and plywood frame and upholstered in faux leather. The stainless steel drawers pulls and chromed steel legs instantly update the modern look of the Erin bed side table. Beautifully shaped, the Erin is a standout piece for any home looking to add a touch of refined style. Made in Malaysia, the Erin will require light assembly for the legs. Nightstand arrived true to the picture presented and it was a perfect match for my mother's faux leather bed frame. In addition to the perfect match, minimal assembly was required (only the chrome feet). I ordered 2 nightstands and they are perfect in size and also modern. They look gorgeous in my bedroom. Both pieces arrive not damaged. 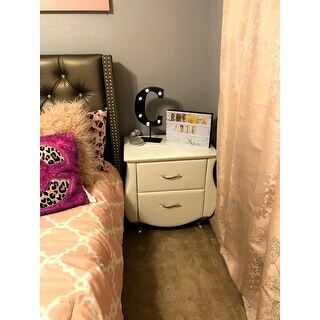 Love this night stand! Looks so adorable in my bedroom. Legs were easy to assemble for my husband. 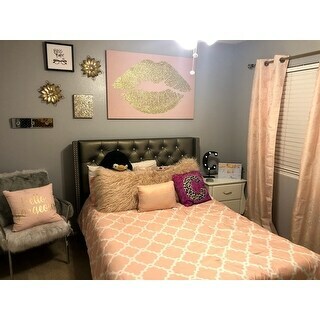 This fit perfectly in my daughters new tween room! My daughter loves the new addition to her room. I especially love the design. It was different compared to your regular square end table. It was easy to assemble, my husband just screwed in the legs. It took less than 15 minutes! i love how easy the drawers slide out. This product does not seem cheap, its nice quality. Beautiful and easy to put the legs on. I really like this nightstand the only this is that the drawers are a little hard to open, considering they came from the same manufacturer that made the dresser I was a little disappointed but it is a nightstand and it serves its purpose. I like it! So beautiful, purchased with the dresser and looks so nice. Very elegant and fits a lot, great storage. Very durable. Material is really nice and cleans so easily if I need to. It is simply gorgeous and elegant! It looks beautiful in my Master bedroom! This was such a wise purchase! I love it!!! "Can this be made with an expression color? " No, this cannot be customized. "When will the black one come back in stock?"